The early cars were sold by automakers to customers directly, or through a variety of channels that included mail order, department stores, and traveling representatives. The first dealership in the United States was established in 1898 by William E. Metzger. Direct sales by an automaker to consumers are now limited by most states in the U.S. through franchise laws that require new cars be sold only by licensed and bonded, independently owned dealerships. 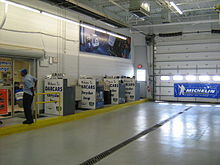 Car dealerships are typically franchised to sell and service vehicles by specific companies. They are often located on properties offering enough room to have buildings housing a showroom, mechanical service, and body repair facilities, as well as to provide storage for used and new vehicles. Many dealerships are located out of town or on the edge of town centers. An example of a traditional single proprietorship car dealership is Collier Motors in North Carolina. Many modern dealerships are now part of corporate-owned chains such as AutoNation with over 300 franchises. Dealership profits in the US mainly come from servicing, some from used cars, and little from new cars. Most automotive manufacturers have shifted the focus of their franchised retailers to branding and technology. New or refurbished facilities are required to have a standard look for its dealerships and have product experts to liaise with customers. Audi has experimented with a hi-tech showroom that allows customers to configure and experience cars on 1:1 scale digital screens. In markets where it is permitted, Mercedes-Benz opened city centre brand stores. Multibrand and multimaker car dealers sell cars from different and independent carmakers. Some are specialized in electric vehicles. 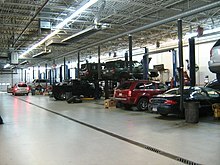 Auto transport is used to move vehicles from the factory to the dealerships. This includes international and domestic shipping. It was largely a commercial activity conducted by manufacturers, dealers, and brokers. Internet use has encouraged this niche service to expand and reach the general consumer marketplace. ^ Quinland, Roger M. "Has the Traditional Automobile Franchise System Run Out of Gas?". The Franchise Lawyer. Archived from the original on 14 May 2016. Retrieved 21 April 2016. ^ Cotter, Tom (22 September 2013). "Former AMC Dealership Full of Cars". Barn Finds. Retrieved 19 March 2019. ^ "New BMW stores to be big, open, beige". ^ "Geniuses smart move for dealers, BMW says". ^ "Subscribe to read". Archived from the original on 2 July 2014. ^ Singh, Sarwant. "The Future of Car Retailing". Archived from the original on 29 April 2017. ^ Bodisch, Gerald R. (May 2009). "Economic Effects of State Bans on Direct Manufacturer Sales to Car Buyers". United States Department of Justice. Archived from the original on 19 June 2015. Retrieved 21 August 2016. ^ "Tesla sets up shop in Dallas -- minus test-drives and sales". ^ "Tesla: we're not car dealerships". Archived from the original on 30 May 2016. ^ "The Perfect Tesla Store". www.tesla.com. Archived from the original on 6 December 2017. ^ Gross, Daniel (11 April 2016). "Tesla's Real Innovation Isn't the Electric Car". Archived from the original on 6 December 2017 – via Slate. ^ Town, Mellisa (7 June 2014). "A Guide To Determining How Much Your Car Is Worth". sellmax.com. Sellmax Journal. Archived from the original on 26 December 2017. Retrieved 31 January 2017. ^ Blanco, Sebastian. "First EVEN EV store opens in Iceland's biggest shopping mall". Archived from the original on 6 April 2015. Genat, Robert (2004). The American Car Dealership. Motorbooks International. ISBN 9780760319345. 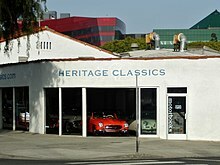 Wikimedia Commons has media related to Automobile dealerships. This page was last edited on 19 March 2019, at 20:36 (UTC).